DIXFIELD — There are few signs of spring on Weld Street as one approaches Dirigo High School. The cardboard cutout boys basketball jerseys on telephone poles and a thick, frozen white carpet across the vast Harlow Park field suggest mid-March is in every way much closer to the mid-February tournaments than opening day of the baseball season in mid-April. Players in blue baseball caps with the familiar English ‘D’ running the hallway in front of Defoe Gymnasium might have been the only sign of baseball season for at least a few miles to Rumford. Monday was opening day for pitchers and catchers in high school baseball and softball across the state. 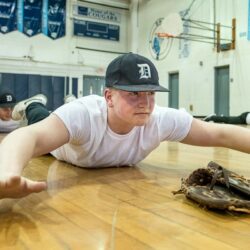 While other spring sports have to wait until next Monday for their first workouts, baseball and softball are allotted the extra week to get arms into shape. 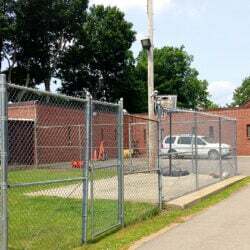 Not long ago, the Maine Principals’ Association removed limits on the number of players allowed to participate in this first week, but activities have to be limited to throwing and conditioning and not other aspects of baseball and softball. Coming off of a rare playoff absence and sub-.500 record (6-10) in 2018, Dirigo starts this season with the same number of players it ended last season — 16. Coach Ryan Palmer doesn’t have many qualms with the numbers considering he had to replace six players, virtually all starters, and played only a limited JV schedule last year after fundraising just to field a team. Dirigo is scheduled to open its season on April 19 at Boothbay. Palmer, who worked out his full squad for an hour before spending the second hour with pitchers and catchers only, said the Cougars will cut back on their JV schedule again this year, mostly due to limited pitching options. Last year’s team was hindered by pitching injuries that exacerbated the overall low numbers and, by season’s end, vice-versa. The coach is optimistic about the season, but again has little wiggle room for injuries. Palmer, who led the Cougars to back-to-back state titles in 2012-13, has talked to other baseball coaches in the area expressing similar concerns about numbers going into the season. “It’s not just here,” he said. At least one school, Rangeley, has decided to not field a varsity team this spring due to lack of numbers. Numbers at Dirigo have steadily declined in recent years, never close to the point of canceling a season but enough that players are noticing the attrition rate. Redmond’s co-captain, senior second baseman Tucker Olsen, is trying to come back from two shoulder injuries — a torn right labrum and dislocated left shoulder — in time to contribute this season. The Cougars found out what being on the losing side of a lot of close games can cost any team, even one that had been a regular participant in the postseason ever since winning three out of four Class C titles at the start of the decade. “Last year was kind of eye-opening when we didn’t make the playoffs,” Olsen said. Redmond, whose cutout jersey hangs a few hundred feet down Weld St., opened his eyes wide when asked about what the Cougars can accomplish this spring. “Anything is possible. It’s baseball. We had a couple of years ago where an eight-seed came in and beat us as a one seed. You’ve just got to get there,” Redmond said.